The legendary NFL receiver, all-time receptions and yards leader for the Green Bay Packers, and Dancing with the Stars champion looks back on his life and career. When he was picked in the seventh-round of 1999 NFL draft, Donald Driver couldn’t find Green Bay on a map. He was given little chance of making the Packers roster, much less of amassing over 10,000 yards in his career and becoming a Super Bowl champion. But in an unlikely journey, Driver has overcome obstacle after obstacle to become one of the most successful players in the NFL. Now, for the first time, Driver recalls his time growing up in Houston, spending nights living in a U-Haul trailer with his mother and stealing cars and selling drugs with his brother to get by. He recalls what it was like to walk into the locker room as a little-regarded prospect out of Alcorn State, an athlete who one year earlier thought his future was in high jump rather than football, and why he would have never made the team without the support of General Manager Ron Wolf. With the help of his winning speed, skill, not to mention, smile, Driver became one of Brett Favre's most-trusted targets and a fan favorite at Lambeau. (Though it took some time for him to perfect his Lambeau leap.) Driven takes you inside the locker room with Favre, shares his experiences with Reggie White, and recalls his more recent role as a veteran leader for like Aaron Rodgers and Greg Jennings during their Super Bowl run in 2010. Over 14 years Driver has been through it all—game winning touchdowns, crushing playoff defeats, frightening injuries, and the glory of the Super Bowl. Traveling off the field, Driver discuss his relationship with his wife and three children: how uncertain they were when he undertook the relentless training necessary to become a champion on the 2012 season of Dancing With the Stars, and how supportive they are of his charity work and service to God. Driver retired on his terms after 14 years in the NFL: as a Packer for life. 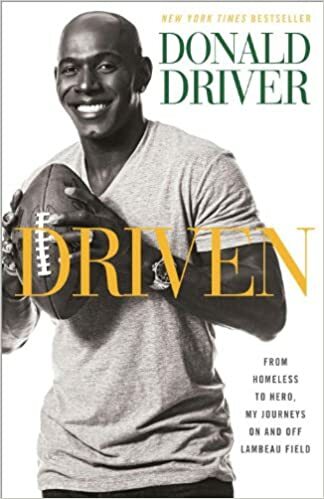 Driven is the definitive story of Donald Driver’s extraordinary journey.